Don't Let Your Eyes Deceive You! This prophecy was fulfilled during King Zedekiah’s reign. After trying to form a revolt against King Nebuchadnezzar, who had previously put him in power, the Babylonians came into Judah, besieged Jerusalem and leveled the city. Capturing Zedekiah, they slaughtered his sons before his eyes and then put his eyes out – making that the last thing he would ever see. Once blinded, they carried him in chains to Babylon. This story got me thinking about how the Bible treats the eye symbolically. In Genesis 3, Eve saw the fruit of the tree was good for food, so she took it and gave some to her husband to eat. 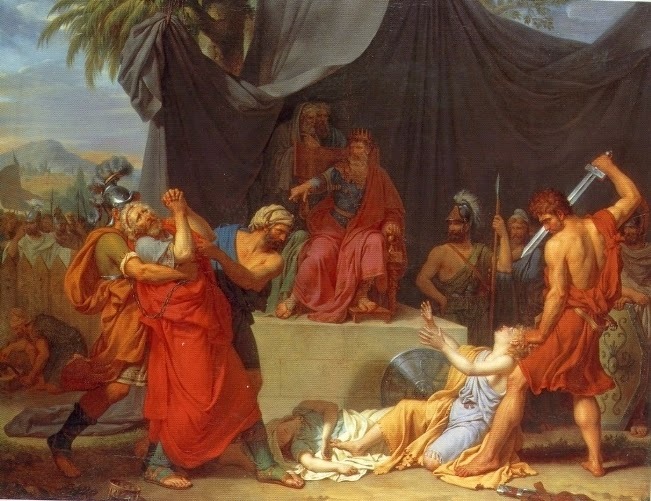 Sampson had eye trouble - he saw a daughter of the Philistines and wanted to marry her (Judges 14:1) and he saw a harlot in Gaza (Judges 16:1) which led to his fate with Delilah. The Philistines put out Samson’s eyes. Only after this did God use him again. Jesus once taught "If your right eye makes you stumble, tear it out and throw it from you; for it is better for you to lose one of the parts of your body, than for your whole body to be thrown into hell." (Matt 5:39). One of Israel and Judah's problems prior to the exile is they trusted too much in what they saw – their temple, their walls, their chariots and their alliances – instead of their relationship with the Lord. Symbolically, God is showing the entire rebellious nation that their eyes are deceiving them and leading them away from Him. So he allows them to be "put out" the king's eyes are put out, the temple is destroyed and the nation is put out of the land so they can no longer trust in their surroundings. The interesting thing in all this is how we can be reconciled through Jesus. In John 9, Jesus healed a man born blind by making clay or mud from the ground and putting it on his eyes. I've always read that with a nod to Genesis 2 - since God created us out of the dust of the ground, could it be that this man's condition was he was born without his entire eye? Perhaps Jesus is creating that part of him that the man lacked in the same way that God made Adam. Whatever the case, Jesus has the ability to heal us of our deepest sin issues. The eye is the source for all kinds of sin. If we voluntarily admit our sins and give them to Him, He can restore us to a proper state. If we continue in rebellion, God just may have to deal with us more strongly in order to keep us from sinning so we can again make the main thing the main thing.